Innovation means doing anything new in existing situation as we understand and small intervention in the cultivation practices, supplementation of nutrients, grains for improving acquired knowledge and enhancement of skill has given a drastic change in the above aforesaid areas and such innovation had an impact that they all have changed the earning of farmers and also have given positive effect on health of women and children. The visual impact can be very seen in the villages. Agriculture Land : 5 acre. Shri Harsingh Oyami deriving his livelihood from the 5 acre at village Binjam block Geedam. Shri Harsingh Oyami tried to grow seasonal crops and vegetables in 3 acre land. The productivity of all crop & livestock’s was very low as compared to standards. During the year 2006-07 Shri Harsingh Oyamiji came to contact and participated in extension activities of KVK. He adopted new improved agriculture technology of Rice, Maize, and Vegetables Cultivation as per suggestion given by KVK expert. As a result, his net income was increased. Now presently his net income is Rs. 455000/- which is an average of Rs. 37916/- per month. Oyamiji getting income of Rs. 150000/- from rice production, Rs. 25000/- from fish harvesting, Rs. 100000/- from Sulphi Juice and Rs. 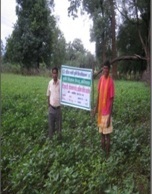 60000/- from forest product like Mahua, Temarind, Tora, Sal Seed and 20000/- from seasonal vegetable.